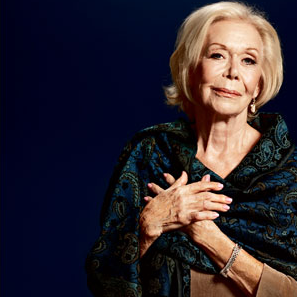 Here’s a link to the new website of the forthcoming movie portraying the life and times of the fabulous Louise Hay. I have read a couple of her books including of course the multimillion bestseller “You Can Heal Your Life” – with more than 30 million copies sold I reckoned it would be worth my time… Another title from the top of my mind is a little book I use regularly whenever I get an unbalance in my body. It helps me in no time figuring out what is wrong mentally – I also occasionally us it if someone asks me for advice about a health issue – the title is “Heal Your Body” – buy them both, read them both and then afterwards teach them to others! Her wisdom and knowledge of the mind / body connection never ceases to amaze me and what she has gathered, combined, figured out and written down is near genius to me – so I’m really looking forward to watching the new movie about her and so should you – december come quick!